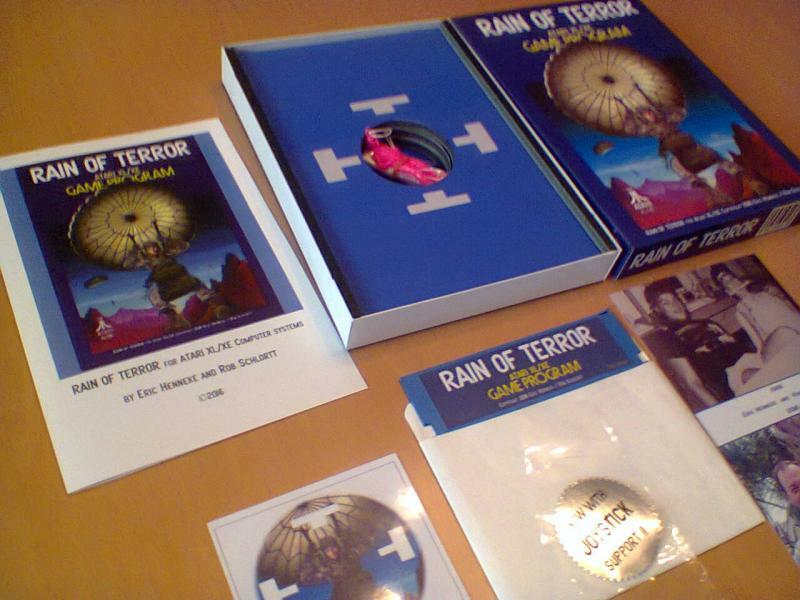 Special Collector's Box Edition of Rain of Terror... with Joystick support !! 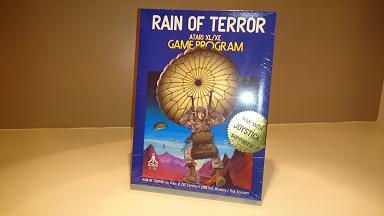 By popular request, Rain of Terror now includes Joystick support !! Rob and I have also made some other minor enhancements to the game. 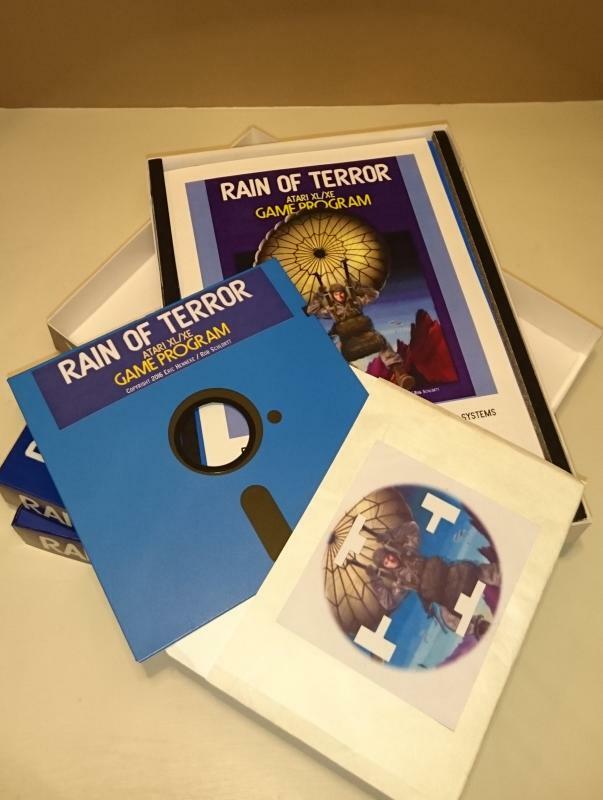 For a limited time: While supplies last, the Collector's Box Edition will feature a very cool BLUE floppy disk! $28 USD plus shipping from the USA. Is this available on cartridge? PM me with cost for 2 boxed cartridges if it is. No, it is only available on 5.25" floppy disk. 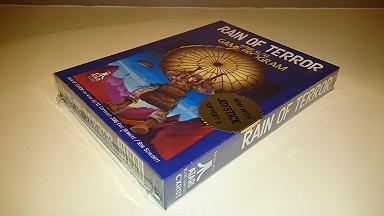 I posted a video on youtube showing Rain of Terror (collector's box edition) game play in Joystick controller mode. Edited by erichenneke, Sat May 20, 2017 11:26 PM. The table wobbling with all that Atari goodness on it scared the crap out of me... and then seeing how close disks and drives are to television and speakers, like that marshal amp scared more! Actually, I crammed everything together temporarily to get that angle to show the game being played with the joystick in the foreground. That's not my "normal" set-up! That little IKEA table was starting to make me nervous too. As for the TV and the amplifier, those are actually quite a bit further back/away but it doesn't look that way in the video I guess. It's a 20 inch TV and a big Marshall amp, so the perspective is just playing tricks. Now that I watch it again, you are right, it looks like it is closer than it really is. Well there is a shipment in route to Germany as we speak, so let's see how it goes. Mine arrived yesterday. Very happy . No problems with the customs. Sweet! Happy to see it arrived safely and has a happy owner. 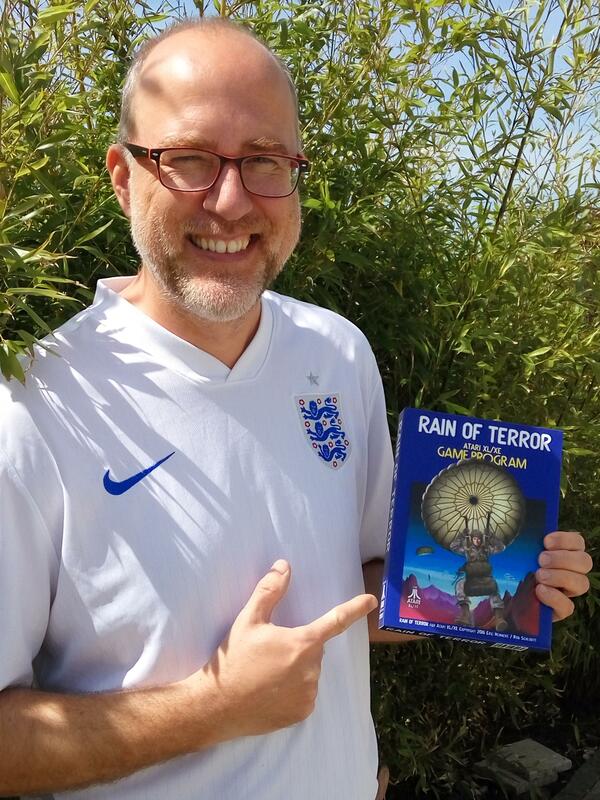 So far the Rain of Terror Collector's box edition has shipped to Germany, UK, Poland, Denmark, Chile, Canada, and the USA ! are physical copies still available ? What kind of trouble is that ? No offense but in _some_ regards things haven't changed much in about 70 years time in Germany.........I've read about extremely strict customs problems in Germany more often. Over here in The Netherlands you will not get charged or have customs even interfere if: the item is worth less than 22 euro's because you are allowed to import something of this value without any charges. However, if someone sends the item without any bill or indicates it as a GIFT on the shipping form, there's is NO trouble here, even with higher values indicated. The reason is customs can't prove you actually bought the item. The only times I had to pay customs taxes and charges when I bought from companies who insisted on putting the correct amount on the form AND did not ship it as a gift AND put a huge bill on the outside of the package. But from what's I've read there is always a customs charge for anything you receive from outside the EU in Germany, is that correct ? If you want to order it, have it shipped to me in The Netherlands and I can forward it to you. Shipments within the EU are no problem AFAIK. It's also just a few euros to ship it from The Netherlands to Germany. Now THIS is how you release a new game for an ancient computer platform in these times. 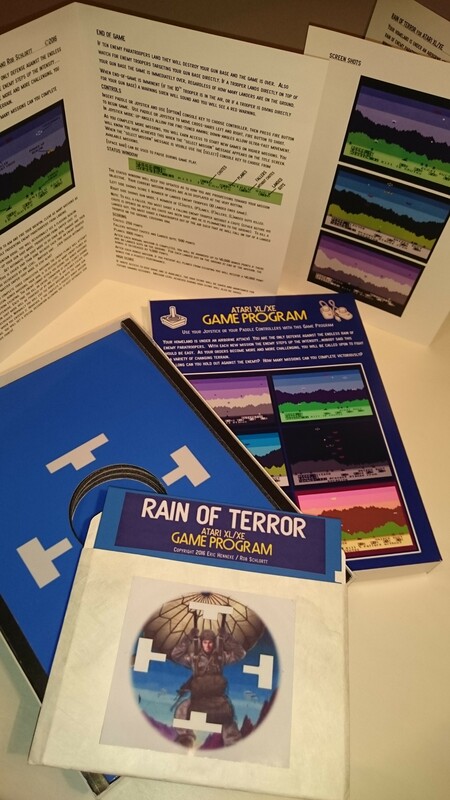 Make the game available for download for those who just want to play the game and on the side release a boxed version with a professional looking box, professionally printed manual and a nice physical format for those who love to collect and all of this for a reasonable amount of money. The label on the floppy.....the "joystick support "star" stickers....and it looks like there's even more included ?) it's all amazing and totally captures the look and feel of how games were packed and promoted BITD. This looks a lot more tempting than those cartridge only releases by some other developers, who threaten you to not try to copy their game, put it in a used cartridge shell with a shabby ink-jet printed label on it (which is printed with either low ink tank level or in the "save ink" mode), include a single Xeroxed A4 (oh no, letter format) sheet of paper with only some black printed text on it and throw it in a plastic bag as a "packing" AND ask 50 bucks for it. Any well done, I really really like it. Oh and the game is "simple" but a LOT. Of fun quick paced action especially with the paddle controller. Too bad I've been spending most of my A8 budget on hardware stuff this X-mas season....I'm VERY tempted to order it. You also score points for that awesome rack of floppy drives and CRT monitor/TV. Edited by Level42, Tue Dec 12, 2017 12:30 AM. 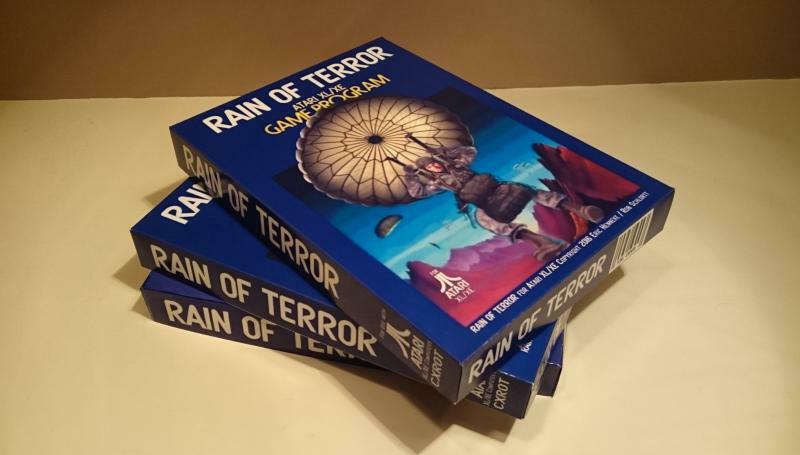 Currently all of the copies of the Rain of Terror Collector's Box Edition physical packaging have been sold out. However, if there is enough interest (and some patience) we can start another production run. To make sense to do another production batch we'd need to know there is demand for at least 8 more copies. Also, (and this is the more "touchy" part of the news I must deliver here)... the price will need to go up. This was a lesson learned from the previous production runs, and it is just a fact. It costs more to produce each of these than originally expected! We are not looking to make money on these, but it doesn't make sense to lose money on each copy sold either! So for the next production batch it would need to be $40 USD per copy, plus shipping. For international shipping from the US, it is quite expensive (another unfortunate fact). However, I have found that 3 or 4 copies can be shipped together (probably even more) at the same rate as compared to one copy. So that is something to keep in mind if you want multiple copies to give away or sell, or if you want to team up with some other Atarians in your local area to make a combined purchase to reduce the shipping cost per unit. Anyway, that's the current status. We can definitely produce more if there is enough interest at the $40 price. You can post your interest here, or send me a personal message if you are more comfortable doing that. I like other people , i'm sure, like physical copies, you can put me down for 1 copy towards the next batch, should it come to fruition. Edited by Lynxpro, Sun Dec 17, 2017 10:27 PM. One copy for me please.